The following is an excerpt from the article “Talking Shopping Center” by Tom Hanchett. The thing that struck me as I started my research was how long it took for that idea to catch on. Despite wide publicity for that first one [Country Club Plaza in Kansas City], shopping centers remained a rarity for thirty years. The problem was cost. Erecting a big new shopping center made economic sense only in very well-to-do neighborhoods. If you’re a real estate developer, it makes much more sense just to sell house lots because you get your money back immediately. You have to operate a shopping center for many years before you make a profit. In Kansas City, the developer was already making a bundle of bucks from his lot sales and he figured he could sell even more houselots by building that shopping center — as an attraction, a loss leader. Not until the mid 1950s did shopping centers appear in any numbers. The first enclosed shopping mall is generally considered to be Southdale Mall, built in 1956 outside of Minneapolis. Then suddenly shopping centers take off, and they’re EVERYWHERE. Why then? Why so suddenly? Terry Holzheimer, economic development director for Arlington, VA, had a clever idea. Usually the density of neighborhoods is measured in residents per acre. But historic neighborhoods and transit oriented development are mixed use, so there may be all sorts of activities that don’t get counted by the usual methods. Why not add residents and jobs together to get a measure of “overall intensity”? That’s exactly what Holzheimer did in his short paper, Urban Development Intensities in the Washington, DC Metropolitan Area. He looked at overall intensity for historic neighborhoods and for new, transit oriented, mixed use centers. For good measure, he also looked at suburban employment centers, including the so-called edge cities like Tysons Corner. The unexpected conclusion: Historic neighborhoods are more intense than edge cities. 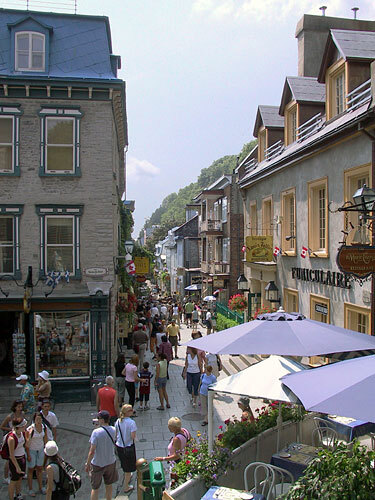 Québec City in the province of Québec: 399 years old and going strong. A few existing sections remain from the 17th century, and most of the Old Town was built during the 18th and early 19th centuries. Climbing the cliff from Lower Town to Upper Town on Côte de la Montagne. 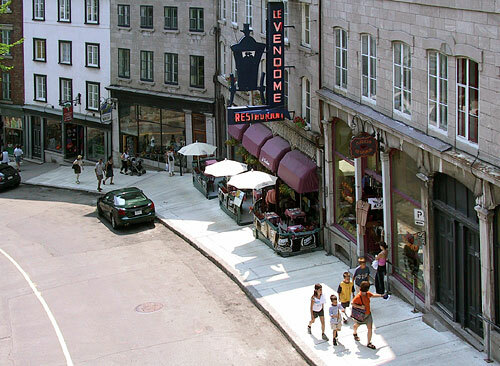 At the foot of the funicular (an easier way to travel up the cliff) on the Quartier Petit Champlain commercial street. … colonial governments passed ordinances requiring the owners of slaughterhouses and other nuisance business to clean their premises and forbidding them to toss their wastes into adjacent streets, street drains, and streams. They also used their police powers to separate the traditional nuisance industries from people living in densely settled parts of towns, villages, and cities by relegating those industries to peripheral locations. To institutionalize the principle of separation, several colonial governments enacted laws that authorized municipal governments to regulate the location of nuisance industries. Elsewhere, colonial and early national town and state governments protected communities against egregious industrial stenches through public nuisance actions, using their police powers to force businesses that violated the norm of separation to shut down and relocate to less densely populated areas. That was the regulatory response to traditional nuisances like slaughterhouses and tanneries. But when industrial pollution began impacting the quality of urban life, the law could not adapt to rapid change. Judges and juries were blind to the harms caused by new technologies, a blindness that seems to have been rooted in cognitive psychology. Industrial pollution was too new and unfamiliar; judges could not conceive that the impacts were equal to — or worse than — traditional nuisances. 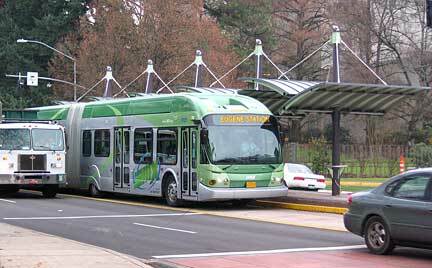 Bus rapid transit service begins in Eugene, Oregon on Sunday, January 14, 2007. The service is called EmX (short for Emerald Express) and it features custom-designed hybrid-electric vehicles, and stops with raised boarding platforms and real time route information. The route will run four miles from downtown Eugene to downtown Springfield with two and a half miles in exclusive bus-only lanes. In honor of the EmX beginning service, here is a transit history poster I made some years ago, titled Streetcars of Eugene 1907-1927. The poster shows the system in 1912, a period when streetcars were used to boost real estate development. That’s why some of the lines ran through empty fields. These days, planners recommend “land use first”: The demand for development and codes that support transit oriented development should be in place before transit lines are built. 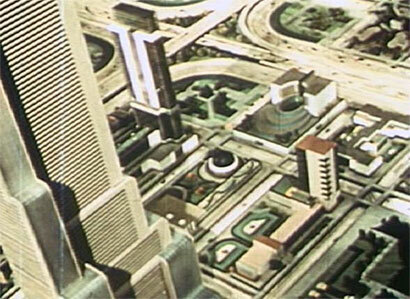 The 23-minute film To New Horizons is a documentary of the 1939 World’s Fair “Futurama” exhibit. The film and exhibit were commissioned by General Motors to promote a cultural and spatial re-organization of American society that would maximize the corporation’s sales for decades to come. The opening sequence, filmed in black and white, is a paean to Progress (with particular attention to the field of highway engineering). Then at minute 7:50, the film switches to Technicolor and begins a tour of the Futurama exhibit — a vision of the futuristic world of 1960. 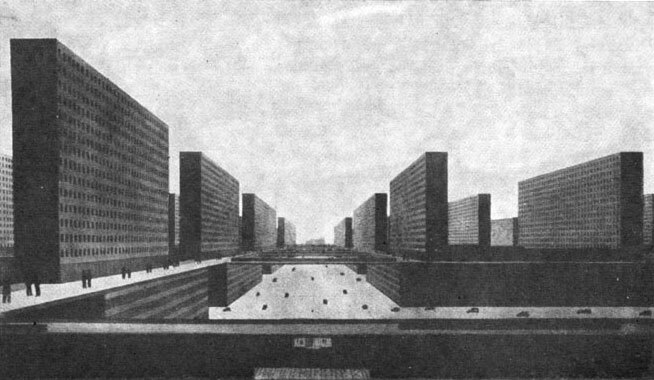 Throughout the film, narration is intoned in a reverent, quasi-religious manner backed by portentous skating-rink theremin music. 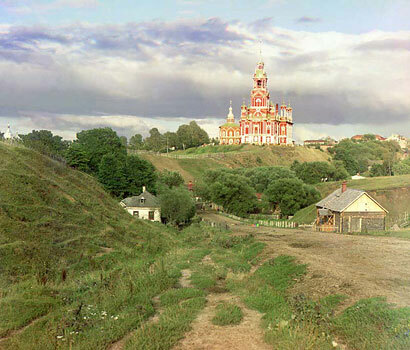 Amazing color photographs of Russia circa 1909-1915 by Sergei Mikhailovich Prokudin-Gorskii, painter, chemist and “photographer to the Czar.” The photos have been digitally restored by the Library of Congress. Here’s the architecture section.